Apostolic Titbits: You Are Worthy of His Love! You Are Worthy of His Love! Many times as we fall in to sin because of the weakness of our indwelling sin nature taking upperhand because of our lack of providing enough spiritual nourishment to the new man inside us. The first thought that the enemy makes us to think after such defeat spiritually is, "You are not worthy of GOD'S LOVE because you have sinned and have shown your unfaithfullness toward Him. He doesn't love you anymore because of your sinful lifestyle." When such thoughts come to us, first of all we must realise that it is not because of our good behaviour He has chosen us, but because of his very own nature of benevolence, mercies and grace he has chosen us. It is of HIS OWN WILL that HE HAS CHOSEN US (John 1:13). We have not chosen Him, He has chosen us and appointed us to bear fruit FOR THE GLORY OF GOD and that OUR FRUIT SHOULD REMAIN FOR ETERNITY AHEAD (Acts 22:14). In other words, we have not intiated this great relationship with God to worry about our weakness, it is God who has intiated it for HIS OWN GLORY. This is the reason Apostle John said, "We love Him because He first loved us." (1 John 4:19). We can be so bold in our relationship with God even to the extent of saying, "I am worthy of GOD'S LOVE". I know of a time when God first started to draw me toward himself on my early twenties, I used to feel so unworthy because I was involved in a lot of besetting pet sins in my life at that time. During this time God began to stir me up to preach HIS WORD to people around me. It happened, every time I would speak his word under His anointing and then would return back to severely go through a time of accusation from the enemy usually. Then I would say to God, "O Lord I am not worthy, O Lord I am not worthy......". Then a couple of days later, God clearly told me to stop my dirge and told me, "You are not worthy my Son, but I have made you worthy." I thought about it deeply and then understood the profound truth that God was trying to make me understand. He was saying to me, "Not by your behaviour I have chosen you to preach, teach and reach people with MY LOVE. But because of my own choice I have put you in to MY MINISTRY to do MY WORK. 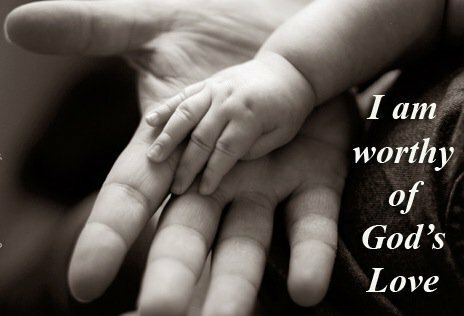 You are my child, so you are worthy of my UNCONDITIONAL LOVE." What a joy and freedom it brought to my sin sick and satan bruised soul of mine at that time. It was like a man dying of thirst suddenly finding an oasis in a bone-dry desert. Praise the Lord! Our Heavenly Daddy's love never ceases even for a split second. He loves us just the way we are. HIS LOVE IS THE ONLY ETERNAL CONSTANT IN THIS EVER CHANGING MATERIAL UNIVERSE. As Jeremiah the weeping prophet was lamenting before God for the nation of Israel, to know whether God will continue to love it inspite of scattering it around the world as a chastisement for its sinful life style in the future, what the prophet heard from God soothed his heart spiritually. Here Jeremiah himself says what God has told him, "The LORD has appeared of old to me, saying: “Yes, I have loved you with an everlasting love; Therefore with lovingkindness I have drawn you." (Jer 31:3). In other words, God was assuring the prophet Jeremiah that he will surely draw HIS PEOPLE towards Himself because of HIS OWN UNCONDITIONAL LOVE in the future, after the chastisements are over. This clearly shows us that even though we are chastised for our sins, we are still loved by the Lord unconditionally. This above verse cemented my faith that God's love towards me is irrespective of my behavior which is one day good when I feed my spiritual man well and another day goes from bad even to worse because of failing to feed my spiritual man enough with HIS WORD and HIS SPIRIT of prayer. We must learn to praise our HEAVENLY DADDY for his unconditional, constant and everlasting love in good circumstances and also in bad circumstances too. Why? Because when we start to praise our Father God for HIS EVERLASTING LOVE, He will be pleased to be enthroned in and upon our life. The moment he comes near in to us and upon us, the temptation and gloom of sin, condemnation and its yoke gets broken, and sin loses its power over us. We again become filled with the conscious goodness of HIS LOVING PRESENCE tangibly. Praise the Lord! The greatest privilege for a man or a woman of God on earth and in the eternity ahead is to be HIS CHILD, there should me no greater desire in our heart than to love our HEAVENLY DAD and be a pleasing child to Him. J. Hudson Taylor (1832-1905) was an English missionary to China. Founded the China Inland Mission which at his death included 205 mission stations with over 800 missionaries, and 125,000 Chinese Christians, said these last words in his death bed, "I am so weak that I can hardly write, I cannot read my Bible, I cannot even pray, I can only lie still in God's arms like a little child, and trust." In other words this faith patriarch prayed, read through his Bible many... times, wrestled with God and fulfilled his assignments that God have him. In all these things, one thing he had learned which at his death bed became a living reality to many people around him, he had learned to lie still in the arms of God like a little child and trust Him always, even to take his dying soul to heaven safely after his death. May it be our daily experience too so that one day when we die we will joyfully be able to tell like Hudson Taylor that we are HIS LITTLE CHILD and be still in God's arms to close our eyes in trust. "12 But as many as received Him, to them He gave the right to become children of God, to those who believe in His name: 13 who were born, not of blood, nor of the will of the flesh, nor of the will of man, but of God." (John 1:12-13, NKJV).